I just got an e-mail from Kirt Hill. 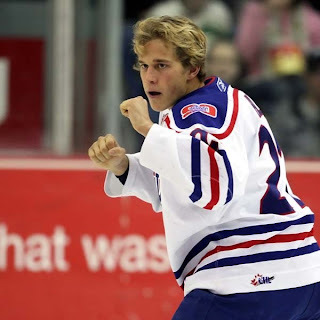 Hill has decided to join the Lincoln Stars of the United States Hockey League. Hill joins the Stars after being released by the Regina Pats and clearing Western Hockey League waivers. 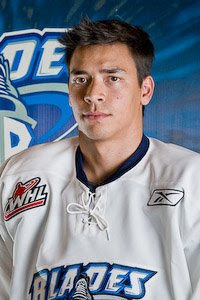 Hill was originally drafted by the Rockets in the second round of the 2003 WHL draft. That season the Rockets took Craig Cuthbert #1, Hill #2 and Colin Joe #3. The only player still on the Rockets roster from that draft is overage defenseman Tysen Dowzak, taken in the 6th round that year. Tyler Myers is returning to the Kelowna Rockets. The 18 year-old was the Sabres 1st round pick in this summers NHL draft. Myers should play tomorrow night against the Everett Silvertips. Myers got into one NHL exhibition game on Saturday September 27th in a 3-2 win over Toronto. Myers wore sweater #57 in the game and collected 15:59 of ice time. That included 3:28 on the penalty killing unit. Myers return adds some maturity to a Rockets defensive core which up until today consisted of just one 18 year-old (McIntosh) and four 17 year-olds. Rockets defenseman Kyle Verdino will miss a few games with what the team is calling a minor MCL sprain. Verdino won't play tomorrow night against Everett and is questionable Friday in Medicine Hat. Verdino could play Saturday in Lethbridge or Sunday in Cranbrook. Rookie forward Stepan Novotny at practice. The slick skating forward had the privilege Saturday night of starting the game on the Rockets number one line with Jamie Benn and Colin Long. Rockets forward Dylan Hood listens in as head coach Ryan Huska gives a few pointers. He looks like a choir boy off the ice doesn't he? Don't be fooled, rookie forward Mitchell Callahan is tough to play against, and reminds me a bit of a young Blake Comeau. The WHL suspended Blazers d-man Nick Ross for two games for his low hit on Rockets defenseman Kyle Verdino Saturday night. Verdino is at the doctors as I write this, but I hope to have more details on his status later tonight. On another note, former Rocket Nick Tarnasky has been traded from the Tampa Bay Lightning to the Nashville Predators. 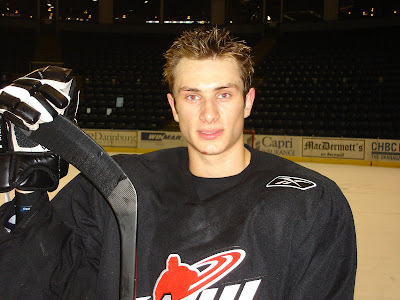 Tarnasky played just 39 games with the Rockets in 2002-2003 before being traded to Lethbridge. 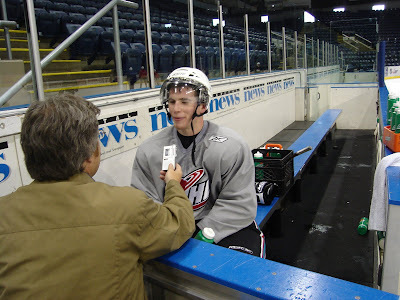 I could come on here and tell you I knew, even when he played in Kelowna, that he would some day play at the NHL level. But that would be a total lie. I would have never dreamt that he would play 169 games at the elite level. Kamloops Blazers head coach Barry Smith isn't winning a lot of friends with Western Hockey League officials in the early stages of the season. 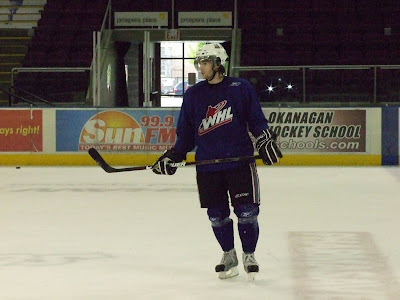 Smith was extremely vocal towards them in a 6-2 loss to the Kelowna Rockets Friday night. I asked Smith one night later about his early season yelling antics. "For me I probably have to tone that down a little bit. I'm vocal and I think sometimes referee's think I'm yelling at them as much as I am at our players. I think that's just me. That's how I get into the game. I have a loud voice that carries. I try to get the guys going and keep them going and motivate them that way. I am emotional and have a passion for the game, and my emotion comes out. But I would like to bring that down a little bit because that comes to the forefront. I want my team to come to the forefront, not me." 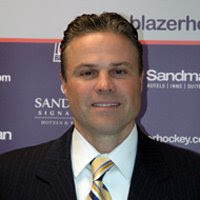 I honestly felt sympathy for Portland Winter Hawks head coach Richard Kromm when I read two weeks before the start of the season that he would likely lose his job with a potential ownership change. As it turned out the team didn't change hands nor did Kromm lose his job. I asked the personable coach about hearing about the news that he was going to be given his walking papers prior to the start of the regular season if the team was sold. "Well you hear so many different things. A lot of it is just out there on blogs, and that's the day and age we live in. Their are lots of rumours floating around. We just have to focus on our jobs and put the best team together and help the kids, and work every day like nothing was going on. But does it feel like you always have a noose around your neck? "You know, because it's been going on so long it doesn't really affect us that much anymore. I mean obviously we think about it and talk about it amongst ourselves but we have to work, and we have to get this team off to a good start." The Rockets have scored 14 goals in their first four games. Nine of those 14 have been scored on the power play. Of the 14 goals the Rockets have scored, the 19 year-old age group has 6 of them. The 18 and 17 year-old age group have four goals each. I should learn more on the status of Rockets defenseman Kyle Verdino later today. The 17 year-old was expected to see doctors today to evaluate his left knee. Verdino was cut down by Blazers defenseman Nick Ross in the 2nd period of Saturday's 5-4 home ice win. Rocket fans had a chance to see Jamie Benn a little earlier this season than one year ago. Benn missed the teams first three games this season after attending the training camp of the Dallas Stars. Last season Benn missed the Rockets first four regular season games before playing in the 5th game after electing to leave the BCHL. Under the category of useless information, Stepan Novotny and Curt Gogol share the same birth date, September 21st. Rookies Aaron Brown and Mitchell Callahan also blow out their candles on the same day, October 12th. What happens when you lead by example on the ice? You are rewarded with an 'A' on your jersey. Kyle St. Denis has been super in the Rockets first four games this season, and the coaching staff have taken notice. St-D is tied with Tyson Barrie for the team lead in points (2+3=5). The likable St. Denis was off my radar when it came to guessing who would be one of four leaders on the team this year, but it's not always the loudest voice that gets the respect of ones teammates. Don't look now, but second year defenseman Collin Bowman is almost half way to his point total of one season ago. Bowman had 9 points last season in 67 games. This year he already has 4 points after just four games. Already 48 games have been played in the Western Hockey League this season. The home team has won 31 of them while the road team has been success 17 times. What that means is the home team has won 65 percent of the games so far this season. A low hit from Blazers defenseman Nick Ross on Rockets defenseman Kyle Verdino was the key in Kelowna's 5-4 win Saturday night. Ross received a five minute major and game misconduct for interference which resulted in the Rockets coming back from a 3-1 deficit to earn the win. Ross' hip check caught Verdino low, sending the 17 year-old to the ice surface in pain after unloaded the puck towards the Blazer net. Verdino never returned, yet his teammates scored three times with the extended man advantage and went to the dressing room after 40 minutes with a 4-3 lead. The penalty will go into the books as a major for interference, but it was more like clipping to me. By no means did Ross intend to take Verdino's knee out, but the hip check wasn't executed properly, sending both defenseman off for the remainder of the game. Three quick goals on the power play, and the game took a 180 degree turn. Verdino will undergo an MRI to get a better idea of the extent of the injury. The Blazers outshot the Rockets badly in the first period, and held the majority of the play. I thought the Rockets were the superior team 5 on 5 Friday night in Kamloops, but the roles were reversed in this one. Blazers defenseman Giffen Nyren again impressed for a second straight night. His ability to skate the puck up ice is tremendous. Nyren had two assists and is a great pickup. Jamie Benn returned to the Rockets lineup after attending the training camp of the Dallas Stars. Benn wasn't his usual self, but still managed two assists. Not bad for a guy who has been to Texas and back. Colin Long continues to amaze me. Two goals Saturday night, and now three goals and an assist in just two games. I'd call that a decent start. The Rockets wore their red jersey's for the first time in a long time. The jersey's are made famous by the teams run towards a Memorial Cup title. The Rockets wore the third jersey to beat Gatineau 2-1 in the championship game in 04. Kris Lazaruk wasn't as good as he was Friday night, but he played his best when the game was on the line. With the Rockets holding a 5-4 lead, Lazaruk made a great glove save off of Blazer forward Jimmy Bubnick to preserve the win. The game last night was delayed from starting when Blazers goaltender Justin Leclerc complained that the net wasn't properly centered in the crease. The off-ice officials looked at Leclerc's complaint, but frankly little could be done about it. I happened to walk down to that area of the rink after the game, and Leclerc's claims were true. The net isn't properly centered in the crease. While it's only about a puck length out, you can bet the ice crew at Prospera Place will have it properly centered for Wednesday night's game. It's nice to have a puck handling goaltender. 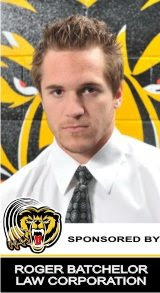 Kris Lazaruk earned an assist on the game winning goal by Lucas Bloodoff in the third period. Saturday nights game was not only a sell-out, it was the Rockets home opener. The Rockets organization did a good job of the opening ceremonies. Short - sweet and to the point. Why is it the Rockets can start the game 'on time' when so many other teams struggle on opening night? If the game is scheduled to start at 7 p.m, start the friggin opening ceremonies enough in advance so not to disrupt the start time. Leafs head coach coach Ron Wilson spoke about Luke Schenn after last night's exhibition loss. "I think if he was in just about any other city you wouldn't hesitate to keep him around. But it seems so many people would be trying to nitpick the kid from the outside, and that's something we need to isolate him from. If he is good enough to make our team in the top four he will be on our team. I don't think it's wise....you could see a kid start at six and keep on improving but, if he didn't and you know how the rules are after 9 or 10 games you can't send him down or back to junior let alone to the minors so your kinda stuck with him if he hit a plateau and stopped improving. And the thing that stinks is we only have ten days to decide." Six different goal scorers contributed to the Rockets 6-2 win in Kamloops Friday night. Cody Almond and Colin Long’s return to the lineup from NHL training camps did not go unnoticed. It seemed like the return of the two veterans gave everyone an emotional lift. Rockets coach Ryan Huska elected to start the game with Almond and Long on the same line along with rookie Stepan Novotny. Long, Almond and Novotny would all score in the teams first win of the season. Novotny could have had two goals had it not been for a great left pad save in the first period. Long found Novotny going towards the net and fed him a beautiful pass, only to see his re-direct hit the outstretched pad of Blazers goaltender Justin Leclerc. When was the last time the Rockets scored 6 goals in one game in Kamloops? It was December 7, 2003 in a 6-2 win. The Rockets power play went 4 for 11 on the night, but it was the teams penalty killing unit that caught my attention. The Rockets allowed just one power play goal on 7 chances. It’s that aggressive penalty killing unit that will force teams to move pucks quickly, while creating doubt in the mind of the opposition that a turnover could create a good scoring chance the other way. Was the officiating bad? Blazer fans will call for the head of Nathan Wieler after this one. But let’s face it, he missed calls both ways and made calls that simply were not infractions. Blazers defenseman Kurt Torbohm's cross checking penalty on Brandon McMillan in the third period was a clean hit and Lucas Bloodoff's interference penalty on a power play late in the game was also questionable. And how Rockets rookie Mitchell Callahan didn't get an additional elbowing minor in a fight with Blazers d-man Jordon Rowley is beyond me. Rowley ended up getting the extra two minutes for roughing. It was a contrast of emotions between the coaching staff at the two benches. Both Blazers head coach Barry Smith and assistant Scott Ferguson were yelling at Wieler while at the other bench, Rockets head coach Ryan Huska and assistants Jeff Finley and Kim Dillabaugh calmly went about their business. It was without a doubt Kris Lazaruk’s best game in a Rockets uniform. The 20 year-old made some tremendous saves including a ‘beauty’ off of Blazers newcomer Dalibor Bortnak. The European forward had the netminder at his mercy, yet Lazaruk stayed with the play and kept his right pad flush to the ice for the best save of the game. Maybe Lazaruk’s strong play was the result of a change of his number. Lazaruk wore sweater #30 in back-to-back games in Tri City and Portland and then changed to #1 for Friday’s game. Backup Adam Brown is now wearing #31. That's Torrie Jung's old number. Speaking of Jung, he has been removed from the Rockets roster all together. Is Lucas Bloodoff a quick healer? Originally the Rockets believed Bloodoff would be out 4 weeks with a broken hand, but after further tests, Bloodoff was cleared to play. Despite the injury, Bloodoff chipped in with two assists. Tyson Barrie was less pro-active offensively Friday night, and it didn’t hurt his game, it helped it. Barrie didn’t get trapped up the ice trying to rush the puck, yet still managed two assists. No question he’s a gifted player offensively, but last night’s game was proof that he doesn’t have to make high risk plays to put up points. Mitchell Callahan again impressed me Friday night. It had nothing to do with his play with the puck, but an aggressive hit on Blazers defenseman Jordon Rowley. Was an elbow part of the hit? Likely. But Callahan's aggressive nature you can't but applaud. You have to remember he is still just 16. The rookie doesn't turn 17 until October 12th. The Rockets received some good news earlier in the day when the Dallas Stars returned Jamie Benn back to junior. Knowing that Benn wouldn’t make the Stars as an underage player, they allowed their prospect one NHL exhibition game before sending him back to Kelowna. It's often said that a good pre-game warmup is crucial to game time success. It appears Rockets goaltender Kris Lazaruk believes in that theory. Just got word that Jamie Benn is returning to Kelowna. He is unavailable for tonight's game but will be in the Rockets lineup tomorrow night. Tonight’s Preview: The Rockets and Blazers are meeting for the first of 9 times this season. The two teams hook up again tomorrow night at Prospera Place. Of those 9 games against one another this season, five will be played in Kamloops with just four in Kelowna. Those games on home ice are tomorrow night, December 27th, Feb 7th and March 14th. After tonight’s game the Rockets don’t return to Kamloops until November 15th. Last season these two teams met eight times, with the Rockets sporting a record of 3-3-0-2. Those two shootout losses came in Kamloops. The Rockets were 3-1 in Kelowna and 0-2-0-2 in Kamloops. The Rockets are riding a 6 game winless streak at the Interior Savings Centre. The teams last regulation win in Kamloops came November 14, 2006 in a 5-4 win. The Rockets enter tonight’s game riding a two game losing streak after back-to-back 5-2 (Tri City) and 2-1 (Portland) losses. The Rockets host the Blazers tomorrow night before welcoming the Everett Silvertips on Wednesday. The Rockets then return to the road for three games in three nights starting Friday in Medicine Hat, Saturday in Lethbridge and Sunday in Kootenay. The Long and Short of It: The Rockets welcomed back last years leading point getter Colin Long this week from the NHL training camp of the Phoenix Coyotes. Long led the team last season with 31+69=100, which was good for 2nd in league scoring. Long was drafted by the Desert Dog’s this summer. Last season Long’s name failed to hit the score sheet just 15 times, including twice against the Blazers. Long was 6+6=12 in 8 games against the Blazers last season. Cody Almond also returned this week from the training camp of the Minnesota Wild. Incase Your Wondering: The Rockets are celebrating their 14th season in Kelowna this year. 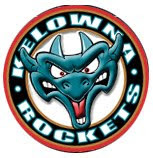 The Rockets moved from Tacoma to Kelowna for the start of the 1995-96 season. Since moving to the Okanagan the Rockets have played 948 regular season games. Tonight’s game is #949. What’s interesting is the team will play its 1 thousandth regular season game February 7th in Kamloops. The Rockets will play their 500th home game in Kelowna February 18th against the Chilliwack Bruins. The franchise has 470 regulation victories to its credit. In the 13 years the team has been in Kelowna, they’ve won 30+ games ten times. Dare to Compare: The Rockets 0 and 2 start is somewhat reminiscent of last season. The Rockets were 0-1-1-0 after two games last season before winning their third game of the regular season. When was the last time the Rockets opened the season with three consecutive losses? It was in 2006-2007 when the team lost four straight before beating Kamloops 5-4 in overtime in game five of the season. Trade Winds Blow: The Rockets solidified their goaltending by acquiring veteran 20 year-old goaltender Kris Lazaruk from the Kootenay Ice for a 4th round bantam pick. 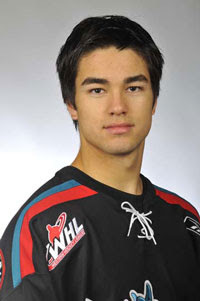 The Edmonton Alberta produce has played 109 games over his four year career in the WHL. Last season Lazaruk played in 51 games. Colin Long is playing in his 161st game tonight. Long has 132 career points. Evan Bloodoff is playing in his 131st game tonight. Brandon McMillan is playing in his 128th career game tonight. Tyson Barrie has 47 career points and is playing in his 74th career game tonight. Kyle St. Denis played his 70th career game Sunday against Portland. Jesse Paradis is playing in his 46th career game tonight. Who’s Back: The Rockets return 17 veterans from last years team. Leading that list is last years leading scorer Colin Long. Long led the team in points (101) and assists (64). Second year forward Jamie Benn is also back. Benn led the Rockets in goals scored last season with 33 in just 51 games. Both Long and Benn combined for 64 goals last season. The Rockets return 6 of their top 7 scorers from a year ago. Gone But Not Forgotten: Six players from last year’s team are no longer around. Brady Leavold, James McEwan and Kristofer Westblom have graduated. Leavold and McEwan are playing pro hockey while Westblom is playing Canadian college hockey this year. Colin Joe and Milan Kytnar were traded to the Edmonton Oil Kings in the off-season while Myles MacRae elected to leave the team and play his twenty-year old season in the BCHL. Nine is Devine: Nine members of the Rockets attended NHL training camps this year. Luke Schenn was in Toronto, Tyler Myers in Buffalo and Brandon McMillan with Anaheim. Colin Long attended Phoenix Coyotes camp, while goaltender Torrie Jung was in Tampa Bay. Cody Almond was with Minnesota while Tysen Dowzak received a tryout with the New York Rangers. Lucas Bloodoff also received a tryout with the Tampa Bay Lightning. Jamie Benn is the only signed player, and attended the camp of the Dallas Stars. The nine players attending pro camps was a team record. Exhibition Exploits: The Rockets were 2-1-1-0 in exhibition with wins over Vancouver and Spokane. The Rockets suffered a regulation loss to the Giants and an overtime loss to the Chiefs. The Rockets scored 11 goals in the four games they played, while allowing 11 goals against. Rookie forward Stepan Novotny led the Rockets in exhibition scoring with 2+2=4. Rockets Review: Last season the Rockets won 38 games and finished with 84 points. Those 84 points were good for 5th place in the Western Conference and a date with the Seattle Thunderbirds in round one. The Rockets would lose out to the T-Birds in seven games. The Rockets had 21 home ice and 17 road wins last season. By The Numbers: The Rockets scored 248 goals last season, 4th best in the Western Conference. The Rockets allowed 215 goals against, 5th worst in the West. The Rockets had the 7th best power play in the WHL last season at 19.9%. 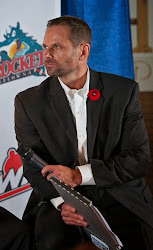 The Rockets would score 82 goals with the extra man, which were the second most power play goals in the league behind the Vancouver Giants 85. 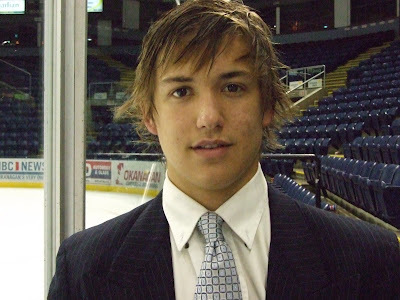 NHL Draft Picks-Training Camp Attendees: Luke Schenn (Leafs 08), Tyler Myers (Sabres 08), Colin Long (Coyotes 08), Brandon McMillan (Ducks 08), Jamie Benn (Dallas 07), Torrie Jung (Tampa Bay 07), Cody Almond (Minnesota 07), Lucas Bloodoff (Tryout Lightning 08), Tysen Dowzak (Tryout Rangers 08). Here is Rockets forward Dylan Hood with some comments heading into the weekend. I spoke to Minnesota Wild director of player personnel Tom Thompson this afternoon about Cody Almond's camp. "He's probably played better every time we've had him out with our people. We consider him a prospect. You have to put it into perspective of what Cody is trying to accomplish. At the camps he's trying to get better, but realistically he is not going to make the team at nineteen. We just hope we have helped his play, so as he goes back to the Rockets he can keep developing as a hockey player. Would he have a good understanding returning to junior of what you want to see in his game? "I don't think Cody will be confused. He had a lengthy meeting with Doug Risebrough, our general manager and myself yesterday and then a further meeting with Doug up in his booth at our game last night. One thing about Doug, when he speaks, not to many people are left confused." So what does he need to improve on? "Consistency. If you look at Cody and what are his attributes? He's 6 foot 2, 200 pounds. He is a fluid skater...he's light on his feet. He can shoot a puck. He's aggressive enough. He can take a hit he can make a hit. But right now his game is in pieces a little bit. He has to pull all of these component parts together and get a consistent game package game in and game out." Cody has a quick release. Is that going to be his bread and butter to make it to the next level? "Doug is convinced now that the way hockey is, the ability to shoot quickly and accurately has never been so important because usually split second chances are few and far between. If you have to get a good shot away, the good people can do it and the ones that aren't so good seem to never get them away." Just got off the phone with Minnesota. Cody Almond is coming back. Almond was one of five players released to their junior teams today. The New York Rangers just called me and said Tysen Dowzak is going to main camp with the Hartford Wolf Pack. The Rangers A-H-L affiliate opens camp on the weekend. From what I've witnessed in the first week of the regular season, I'd hope the Western Hockey League is thinking of going in a different direction in 2009-2010. If that means starting the regular season later and reducing the number of games during the regular season from 72 to 68, then it should be done. Why? The late start would surely help alleviate the headaches that many teams are facing as they see players participating in a series of NHL exhibition games. Those teams need time to decide whether to keep the player on their roster or send them back to junior for a little more seasoning. I can't see reducing the schedule by four games sitting well with owners, who will lose revenue with the loss of two home dates. I anticipate the WHL delaying the start of the regular season in 2009-2010, which means even rookie and training camps can start in mid September instead of late August. Where is Tysen Dowzak? Even the New York Rangers aren't sure. I spoke to the Rangers this morning, and they believe he is still with the team, yet they can't explain why the Rockets defenseman isn't on the teams training camp roster. I hope to find out where he is after a phone call with the Rangers brass this afternoon. It looks like some exciting things ahead for the Kelowna Rockets website. The site, which now includes video, will be a nice addition in providing fans with the latest information. Not only is it great to ready articles on the site, but the video's will provide a much more user friendly dimension. Kris Lazaruk has never attended an NHL training camp. I was surprised when I learned that while talking to him at practice Wednesday. NHL tryouts are not handed out like candy on Halloween night, but you would think some team would have been interested in taking a look at him? One thing is for certain, if Lazaruk has a solid year in the Rockets goal and leads them to a long playoff run, NHL scouts will take notice and grant him that try-out that Lazaruk has been yearning for. Speaking of goaltenders, what does the future hold for Torrie Jung? Is a team interested in trading for him, or does he clear waivers making him eligible to play in the Ontario Hockey League or the BC Hockey League? Moving back to the BCHL would definitely be a step back for the likable goaltender. I think the BCHL is a good developmental league, but not if your 19. Unfortunately for Jung, his age is working against him. The most interesting news from the post is the fact that Benn is playing in tonight's exhibition game against Colorado. He played only one game with the Rockets as a 16 year-old last season, so I didn't get a chance to meet Curt Gogol. But I did just that Wednesday after practice and was extremely impressed with the Calgary resident. Gogol is as personable as they come, and is extremely well spoken. Let's just say he will make this radio guys job much easier. While Curt's father played in the Western Hockey League, it's my general belief that this bright defenseman will be making a name for himself before very long. This season when his name is mentioned so too will his dad's league record for penalty minutes. You simply can't avoid it. But that will soon change as he steps out of the shadow of his father with his solid play. What makes Gogol's appearance on the Rockets defensive core this season impressive is he was a 8th round pick in the 2006 WHL bantam draft. In that draft, Gogol was the 4th defenseman selected by Rockets director of player personnel Lorne Frey. Taken ahead of him were Tyson Barrie, Collin Bowman and Aaron Borejko. All three are on this years team. Throw in Kyle Verdino, who will likely move back to forward if and when Luke Schenn, Tyler Myers and Tysen Dowzak return from NHL camps, and the Rockets took no less than 5 defenseman in that draft. It's not often a 8th round bantam pick plays for your team, especially in Kelowna. Only Matt Brusciano, Vaughn Watson and Kevin Korol have played for the Rockets after being selected in the 8th round. 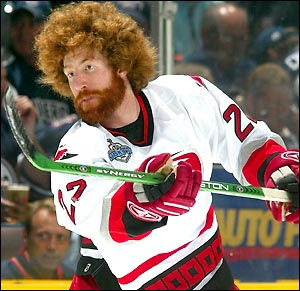 Oh ya, I forgot Mike Commodore, who was selected by the Rockets in the 8th round in 1994. He never played in the Okanagan, but he is playing in the NHL. That alone should give Gogol a clear indication that a late bantam selection doesn't mean a dream of playing in the NHL can't be realized. Just ask the 8 year NHL veteran with the red mop on his head and the Stanley Cup ring on his finger. "Things are going really well here in Buffalo. All of the other junior players have gone back to their teams, so its a lot of fun playing with all the vets and older players. The days are pretty short here. We are usually at the rink from 9 am until 1 pm on average with a stretch practice and workout almost everyday. The pace of the game even at training camp is a lot faster so its been a lot of fun and a lot of work adjusting to the pace. I'm not too sure how much longer I will be here but hopefully I will get into at least one exhibition game. If not, that's fine. The experience I'm getting here even without a game is great!!" 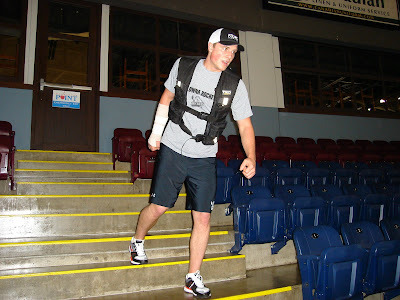 Injured forward Lucas Bloodoff putting on a sweat by running the stairs. Bloodoff is out no less than 4 weeks with a broken hand. I wanted to take a picture of Rockets goaltender Kris Lazaruk's paint job on his mask. 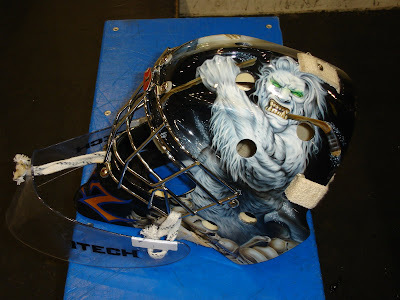 That will have to be removed as GM Bruce Hamilton isn't keen on his goaltenders having outlandish art work on their masks. In speaking with Lazaruk and Adam Brown today, they both should have colour coordinated equipment in about a month. For now, Larazuk is wearing black pads with the gold trim of the Kootenay Ice. Brown's gear is white with green trim after playing midget hockey in Dallas. It's a huge learning curve for rookies making their mark in the WHL. Here 16 year-old Spencer Main gets grilled by Cap News reporter Warren Henderson. Ok, not grilled. But media attention is just part of it when your playing at this level. My feeling is the players love it. A picture of Rockets rookie defenseman Curt Gogol. The well spoken 17 year-old was a pleasure to talk to this afternoon. I'll share more on him on a post tomorrow. I had to laugh this morning when I saw the CHL Top 10. The Rockets were punted from the top ten while any team that managed to win two games on the weekend are now considered the class act. The exception was Spokane, who stumbled with a win and a loss, yet remain in the top ten. The panel was so impressed with the Prince George Cougars start to the season, a team projected to struggle to make the playoffs, that they are now the 8th best team in the nation. Give Cougars head coach Drew Schoneck a raise! But hey panel members, the Portland Winter Hawks were 1 and 1 on the weekend. Why didn't they cut the top ten? Sour Grapes Or The Gospel Truth? No team has been affected more by the late start of NHL training camps than the Kelowna Rockets. When all is said and done, it may be five games - at a minimum - into the season before all 9 players are back playing junior hockey. Luke Schenn and Jamie Benn will be the late stragglers, if they return at all. Being without top end players not only hurts the Rockets in the standings but it brings down the level of play across the league when it needs it most, at the start of the season. Play is sluggish and choppy as is without these marquee players. If I was a season ticket holder I'd be pissed if Seattle's Thomas Hickey or Everett's Kyle Beach weren't in the lineup when that particular team came to town. I want to see the best of the best in this age group, but with NHL training camps starting so late I'm seeing several teams icing extremely young rosters. I doubt it's the reason why opening night crowds in Prince George, Kootenay and Portland were laughable, but it would keep me away from spending my hard earned money. Maybe watching games from January on is a good idea. Then the rosters are set and the play will surely be close to it's peak. Cody Almond won't be in the lineup Wednesday when the Minnesota Wild meet Columbus in an NHL exhibition game. Almond will be watching the game from the press box. While Almond is obviously enjoying the experience of rubbing shoulders with the pro players in practice, why don't the Wild do the player and your partner - the CHL - a favor by sending him back to junior so he can help his team? In my opinion that junior age player should be in that early exhibition game. If not, he should be back in junior. The fact that many of these teams are dragging their feet by not playing these prospects, yet are holding onto them, is having a huge impact. Jamie Benn and Tyler Myers are two examples of players who are with their respective pro teams, yet have failed to see any pre-season action. If they are so called 'bubble players', should they not be thrown into an early exhibition game to separate the wheat from the chaff? If you have no idea what I meant in that last sentence, ask a farmer! I've never been much of a 'numbers' guy, but this caught my eye. The Rockets will be playing their 949th regular season game Friday night in Kamloops. Those numbers are courtesy of 13 seasons in Kelowna since the team moved from Tacoma for the start of the 1995-96 season. The Rockets will play their 1 thousandth regular season game February 7th against - you guessed it - the Blazers on the road. Jamie Benn is not playing tonight as the Dallas Stars open the pre-season with a game against St Louis. The Rockets are reporting forward Lucas Bloodoff will be out 4 weeks with a crack in his hand. The incident happened Saturday in the Tri Cities when Bloodoff took a shot off the hand. If Bloodoff infact is out for a month, he would miss 12 games before returning October 24th against the Chilliwack Bruins. Love him or hate him, Toronto Star writer Damien Cox is a good read. Here is a portion of an article where he answers this question. Would the Leafs ever seriously consider keeping Luke Schenn in the NHL this fall? The answer should be no, a thousand times no, and certainly both GM Cliff Fletcher and coach Ron Wilson have been upfront with their sentiments that Schenn would have to play out of his mind to stick with the big club this season. But then, we've heard that before. The Leafs, historically, have not been very good at either identifying young defencemen through the draft or carefully sculpting those that they do take into quality NHL players. The best two defence draftees in Leaf history were probably Ian Turnbull and Tomas Kaberle (Borje Salming was never drafted). 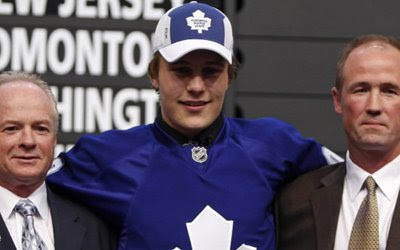 Turnbull came to the NHL after four full seasons in junior hockey, while Kaberle arrived at the age of 20 after playing two full seasons with Kladno in the Czech elite league.To maximize Schenn's chances of being full value for being drafted fifth overall, he needs to go back to junior for a fourth and final year and play on the national junior team, then needs two full seasons in the AHL. That would have him ready for full-time NHL work for the 2011-12 season. He would still only be 21.If he dazzles before then, you could get him to the NHL for the 2010-11 season. But no matter how good he looks this fall or next fall, putting him in the NHL before 2010 at the earliest will be rushing him. It's been proven time and time again. The biggest challenge for Leaf management is to set a course and stick with it, and ignore the inevitable suggestions that if Schenn isn't in the NHL soon, he's a bust. They're already saying that about 22-year-old Justin Pogge, who still has a chance but needs more grooming and more patience.So the answer is no, there's no chance the Leafs will keep Schenn this fall. But the pressure on this franchise to prove it has a future by getting kids to the bigs fast is unrelenting, and has only rarely been resisted for very long. I've been corresponding with Paul Myers, the father of Rockets defenseman Tyler Myers. Paul tells me Tyler won't play tonight when the Buffalo Sabres play an exhibition game in Roberval Quebec. But that said, Tyler remains in Buffalo where he is practicing with the team and could play in a pair of exhibition games this weekend. Lemiuex? MacRae would certainly like to put up big numbers like Mario did, but for the moment will settle for wearing the same number that Lemieux once wore in Pittsburgh. MacRae is wearing #66 with the BC Hockey League's Victoria Grizzlies this season. MacRae has 1+3=4 in 6 games as a 20 year-old this season. His coach in Victoria is former NHL'er Geoff Courtnall. Colin Long will be back at practice with the Kelowna Rockets tomorrow. Long was one of three players re-assigned today by the NHL's Phoenix Coyotes. The only shame for Long was he was sent back prior to the Coyotes first pre-season game. On a side note, Luke Schenn was a +2 and had over 19 minutes of ice time in the Leafs 7-4 exhibition win over the Buffalo Sabres Monday night. Schenn did not register a point or a penalty minute. Tyler Myers did not dress for Buffalo. Former Rockets defenseman Mike Card had a rough night for the Sabres. Card was a -3. I'll Admit Jung Was A Favourite! Broadcasters are suppose to be unbiased. We are not suppose to have favourites. I could sit here at my computer and tell you that I like all players equally on the Rockets roster, but that would be an outright lie. Torrie Jung was one of my favorites, and I'm sincerely sad to see him go. It's not what he did on the ice that won him favour in my eyes, but it was the way he treated me off the ice that had me saying "I like this dude". The internal decision to trade for an overage goaltender, making Jung expendable won't be questioned by me because I don't have a clear understanding of why. They obviously wanted an upgrade at that position and believe they've managed that with the acquisition of Kris Lazaruk. That said, fans do have the freedom to second guess management. You can argue that Jung wasn't given a fair shake of being a starter in Kelowna this season because he didn't even play a game. Others believe he was handed the baton last season when Kristofer Westblom struggled and never took advantage of the situation. I can only trust Rockets management, and believe the decision is for the betterment of the team. But in saying that, I'll miss Torrie Jung. I won't so much miss Torrie Jung the player, as I will Torrie Jung the person. Don't Be Blue At 0 and 2! Ok, get ready for everyone to panic about the Rockets 0 and 2 start. Losing 5-2 in the Tri Cities and 2-1 in Portland was not what the team envisioned heading into the weekend, but considering who remains at NHL training camps, did we expect them to open the season 2 and 0? Not one for excuses, the coaches won't let the players off the hook, but having a lineup that consisted of three 16 year-olds and ten-17 year-olds makes it extremely hard to win on the road this early in the season. Why shouldn't we panic with the 0 and 2 start? The Rockets started the season 0 and 2 in 2004-2005. That year they won the WHL title. Who did I like on the weekend? I thought Kyle St. Denis worked hard in both games, and I didn't mind the play of defenseman Curt Gogol. I also found it interesting that Aaron Borejko recieved significant power play time on the weekend. The coaching staff clearly see an upside to the rookie defenseman's abilty to make smart plays with the extra man. Borejko is a 5th round pick of the Rockets from 2006. Lucas Bloodoff will be out of the Rockets lineup indefinitely with a broken hand suffered in Saturday's 5-2 loss to the Tri City Americans. Bloodoff broke the hand while trying to block a shot. It was the 19 year-olds first game back after attending the training camp of the Tampa Bay Lightning. The Rockets welcomed back Brandon McMillan from the NHL training camp of the Anaheim Ducks. McMillan arrived at the rink in Tri Cities to late to play in the teams opening game, but was in the lineup Sunday against the Hawks. Give the Portland Winter Hawks some credit in Sunday's win. They received solid goaltending from Jordon White and two goals from Colin Reddin in the win. While the Rockets allowed just 9 shots on goal through 40 minutes, the Hawks were able to squeeze out the home ice win. For a team that won just 11 games all of last season, to get a victory this early in the season is huge. What wasn't huge was the crowd last night in Portland. It was sad to see. When just 18 hundred fans show up in a building that seats 10 thousand, it must be extremely disappointing for the players. It may take more than just winning for the Hawks to win back their fans. I had a chance to speak with Keith Hamilton before last night's game. Hamilton is the 16 year-old Portland goaltender who was born and raised in Kelowna. Hamilton's dad - Larry - is the Kelowna Rockets billet coordinator. In speaking to Keith, he says his role model is former Rockets team captain Brett Palin, and for good reason. Keith Hamilton's family billeted Palin for the entire 5 years he played in a Rockets uniform. Hamilton's mom, dad and sister took in both games on the weekend. In speaking to Hawks head coach Richard Kromm, he anticipates Hamilton playing in close to 20 games in his rookie season. I spoke to the public address announcer of the Portland Winter Hawks prior to Sunday's game. He told me he is now in his 18th season behind the mic, and will call his 600th home game in October. His "here come the Hawks" came through loud and clear during Sunday night's game. I found it strange that the Hawks organization allowed music to be played while the play was going on during the first period. You see it in basketball, but I just don't think it fits well with hockey. I found it took away from the game, and didn't add to it. It will be a sad day today as Torrie Jung says goodbye to his teammates. 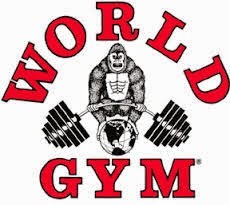 Jung will clean out his locker before heading to Nanaimo. Jung will sit at home as the Rockets work out a trade. Jung was made expendable when the Rockets acquired 20 year-old goaltender Kris Lazaruk from the Kootenay Ice Friday night. I've heard that Spokane Chiefs radio man Mike Boyle has his name on the Memorial Cup. The Chiefs, winners of the covetted trophy in 2008, had all of the players and coaches names put on the cup and included their radio guys name as well. You have to marvel at AM radio. Friday night as we were traveling to Tri City, we tuned into a game between Prince Albert and Saskatoon. For about 20 minutes we could clearly hear CKBI's Drew Wilson calling the play-by-play on AM 900. Tonight’s Preview: The Rockets and Hawks are meeting for the first time this season. After tonight’s game these two teams won’t meet again until January 9th in Kelowna before the Rockets return to Portland on February 16th. The two teams close out the seasonal series March 11th in Kelowna. These two teams met four times last season with the Rockets winning all four games. The Rockets are riding a three game winning streak in Portland. The last loss was September 30/06 in a 5-2 setback. Following tonight’s game the Rockets are in Kamloops Friday before hosting the Blazers in their home opener Saturday night. Last night the Rockets fell 5-2 to the Tri City Americans. Mitchell Callahan and Tyson Barrie scored lone goals for the Rockets, who trailed 3-0 and 4-1 at the period breaks. Jason Reese scored three times for the Americans. The Rockets are now 3-4-1-0 with a tie in their last 9 regular season openers dating back to the 2000-2001 season. Six of the Rockets next eight games are on the road. A Night of Firsts: Five members of the Rockets made their WHL debuts last night. Mitchell Callahan scored his first career WHL goal in the loss while defenseman Aaron Borejko earned his first career point with an assist on a Tyson Barrie power play goal. Overage goaltender Kris Lazaruk made his Rockets debut after being acquired from Kootenay late Friday night. Broadcasters Quick Hits: Rookie Stepan Novotny played high school hockey at Shattuck St. Mary’s, the same school that Sydney Crosby attended. Rockets defenseman Tysen Dowzak also attended the prep school…Rookie forward Mitchell Callahan scored 38 goals last season playing with the LA Midget Kings. Callahan is an undrafted player, but made the team on a tryout….Rockets 17 year-old goaltender Adam Brown’ father Newell is an assistant coach with the Anaheim Ducks...Rookie defenseman Curt Gogol’s father Brent played with Victoria and Billings of the WHL in the late 70’s. Brent Gogol still holds the WHL record for penalty minutes in a season with 511 in 1977-78….The Kelowna Rockets have 6 American born players on their roster this season, a franchise high. Everett also has six. Sorry folks. I have been unable to share thoughts on the Kris Lazaruk trade until now, as technical problems have kept me running all day long. The good news is things are back to 'normal', and we will be on the air at about 6:40 tonight. You can hear from the newest Rocket as we interview Lazeruk at that time. Their Must Be A God! Yes their is a God. He's answered my prayers. What you are witnessing is Prince George play-by-play caller Ron St. Clair sampling food up in the press box at CN Centre. No...this is not a joke. No...this picture has not been altered in any way. I have bashed the Cougars organization in the past for the poor press box set up, but now I must praise them for the small step they've taken. Well done Prince George Cougars - well done. If you want to know what's really funny about this photo, it's the fact that St. Clair was sampling the food while the game was going on! I'm joking!!! "Camp is going very well. Rookie camp just ended. We played two games against the Kings rookies in Phoenix. It was a great experience. Some of my family came out to watch so it was nice to be able to play in front of them. We had fitness testing today. I got invited to stay for main camp ,which starts tomorrow. I am on a team with Shane Doan, Ed Jovonavski, Pete Mueller and others. I'm excited." skate with the guys for the rest of camp." Tonight’s Preview: The Rockets and Americans are meeting for the first time this season. The Rockets make a return visit on November 4th before the Americans make two appearances in Kelowna on November 19th and January 14th. Last season these two teams opened the 2007-2008 season against one another, this time in Kelowna, with the Americans earning a 6-5 overtime win. Overall the Rockets were 0-3-1-0 against the Am’s last season, and were out-scored 18-8. The Rockets are riding a four game losing streak in Kennewick, dating back to the 2005-2006 season. The last win by the Rockets at the Toyota Center was February 25, 2006 in a 4-3 victory. Following tonight’s game the Rockets are in Portland Sunday for a 5 o’clock start before traveling to Kamloops to face the Blazers Friday September 26th. The Rockets first home game of the regular season is Saturday September 27th against the Blazers. The Rockets are starting the regular season on the road for the first time since September 21, 2006 when they fell 3-1 to the Bruins in Chilliwack. The Rockets are 3-3-1-0 with a tie in their last 8 regular season openers dating back to the 2000-2001 season. Seven of the Rockets first nine games are on the road. "My experience in Traverse City was a good one. I met some new guys and we came together well as a team winning the tournament. It's a great honour playing for the Dallas Stars in a tournament like that. I got to play with some good players like ex-Seattle Thunderbird Aaron Gagnon and Fabian Brunnstrom, a new player to the Dallas organization who they are very excited to have. I've been through one day of main camp now and it is pretty different seeing all the NHLer's walking around the same dressing room as you. It's an awesome feeling and I'm excited to skate with the guys for the rest of camp." "My experience in Traverse City was a good one. I met some new guys and we came together well as a team winning the tournament. It's a great honour playing for the Dallas Stars in a tournament like that. I got to play with some good players like ex-seattle thunderbird Aaron Gagnon and Fabian Brunnstrom, a new player to the Dallas organization who they are very excited to have. I've bin through one day of main camp now and it is pretty different seeing all the NHLers walking around the same dressing room as you. It's an awesome feeling and I'm excited to skate with the guys for the rest of camp." "My experience in Traverse City was a good one. I met some new guys and we came together well as a team winning the tournament. It's a great honour playing for the Dallas Stars in a tournament like that. I got to play with some good players like ex-Seattle Thunderbird Aaron Gagnon and Fabian Brunnstrom, a new player to the Dallas organization who they are very excited to have. I've bin through one day of main camp now and it is pretty different seeing all the NHL'ers walking around the same dressing room as you. It's an awesome feeling and I'm excited to skate with the guys for the rest of camp." I am looking forward to the opening ceremonies Saturday night when the Tri City Americans raise a banner to the rafters. I hope the Americans make a big deal about winning the U-S Division title last season, after winning over 50 games a year ago. While the management and coaching staff may say it’s time to turn the page, it’s worth taking a moment and reflecting on a terrific season that featured more highs than lows. I have the benefit of having my color analyst Gord McGarva join me for both games South of the border this weekend. McGarva will be like a kid in a candy store as he experiences Toyota Center and Memorial Coliseum in Portland. Often times it’s those around you that are experiencing things for the first time that make you appreciate how lucky you are as broadcasters to be traveling across Western Canada and the United States all winter long. I want to thank Jon Whiting, a Seattle Thunderbirds fan for the nice e-mail he sent me this week. Not only did he have some nice things to say about my work, but he invited me for a drink with some of the WHL fans in his neck of the woods next month. I just may take him up on it, considering the Rockets play in Everett and Seattle on back-to-back nights. Remind me not to say anything bad about the Tips or T-Birds this season. If the e-mail from Jon is any indication, those fans in Washington State are a good bunch. I am looking forward to my stop in Portland Sunday night. I am interested in seeing what type of crowd shows up considering the Hawks won just 11 games last season. After all the off ice turmoil in that city, are the fans turned off by all the negative press? If I enjoy one thing about my trip to Portland, it’s the PA announcer saying “Here come the Hawks’ as they enter the ice. The sad thing is, I have never actually talked to the gentleman behind the microphone. We have exchanged hello’s, but that’s it. I will make it a point this season to stop by and introduce myself to an individual who brings a unique, yet traditional saying that has been heard at Hawks games ever since I came into the league in 1995. I wanted to say a special hello on this blog to Ross Ruttle. The majority of Kelowna Rockets fans will know Ross as the deep voiced anthem singer who has belted out ‘Oh Canada’ at Skyreach Place/Prospera Place during the teams run to two WHL championships and a Memorial Cup. Unfortunately Ross Ruttle is ill, and his strong singing voice is no longer heard at home games. But that will all change Saturday thanks to the magic of radio. I searched into some of my old recordings of games from the 2004 Memorial Cup and found Ross singing in it’s entirety, ‘Oh Canada’. So on our first broadcast of the season, Ross Ruttle’s big voice will again be on the airwaves, as we have him singing the national anthem. I spoke to Ross today, and he’ll be listening Saturday night. He’s a special man who had the special gift of music taken away by illness. It will be a pleasure to have him grace our airwaves for the Rockets opening game of the season. While it may be pre-recorded, it will sound like he's there. What's so cool about his rendition of 'Oh Canada' is he sings part of it in french, and you can hear the Rockets fans in the background yell out 'Guard' at the appropriate time. New technology hits the airwaves during our Rockets broadcast Saturday night on AM 1150. While it's old to some, it's new for me as we use a system of presenting the games to the listeners on the road with a clear studio quality sound, heard previously on home games only. I hope those listening enjoy the improved quality of the broadcast on road games this season. That's Colin Joe, now of the Saskatoon Blades. The 20 year-old defenseman will be wearing sweater #47 with the Blades this season. Not only that, but C-Joe has been named an assistant captain.